My first attempt at marmalade was using a very non-traditional citrus ingredient, the Buddha's Hand Citron. 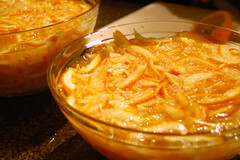 But I still wanted to try making marmalade with the traditional Seville orange. Seville's have just recently started appearing at shops here in Toronto so I loaded up on and started out with trying 2 different recipes. The first recipe I used was from a recent episode of Good Eats. I've always liked Alton Brown's show for his mix of science and cookery. For a contrast I used a recipe that an old neighbor of mine was glad to share. 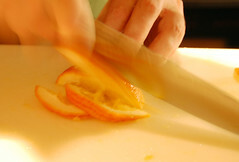 As a columnist at the Toronto Star he would publish his wife's recipe annually when Seville orange season rolled around. What I wanted to see by trying out the 2 was how different would they be? Alton Brown's recipe can be made in a day, Ayesha's took 3... Would Alton's scientific approach trump Ayesha's tried and true, year in year out version? Alton's was tasty, but I really did prefer Ayesha's in the end. I followed both to the letter but the texture of the peel in Alton's was still a bit to hard and bitter, I think it could have used a longer boil to soften it, or was it the lack of soaking time that Ayesha included in her process? 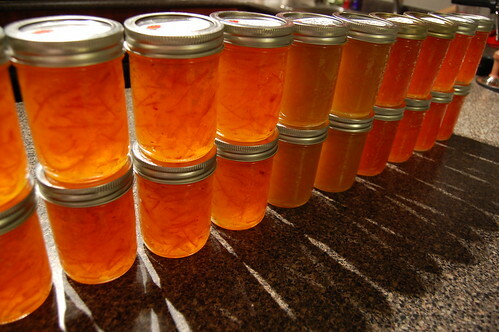 So now after all that Marmalade making I have over 20 jars completed. Looking at all the fantastic ideas that have started rolling in for the Tigress Can Jam, I'm now inspired to try something outside the marmalade realm. When I do decide to make seville orange marmalade again I will be going with Ayesha's recipe. Below is her recipe as it was given to me. 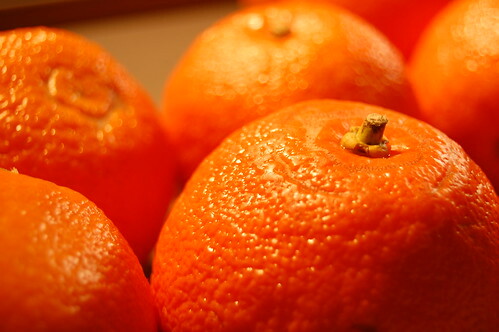 Look for fruit with soft, shiny skin, never mind the warts. Eight oranges will do first time out. Wash and dry the fruit. 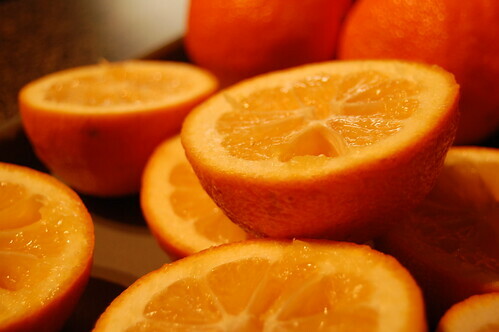 With a sharp knife, slice the whole oranges as finely as you can - skin, pith and pulp. But be careful not to cut the seeds or let them dry out - they contain the pectin and you'll need them. You can either leave the seeds with the mixture to boil, skimming them off just before you bottle the marmalade, or put them in a cheesecloth bag, leaving them to boil until you remove them again just before bottling. Put the sliced oranges into a large bowl, earthenware if possible, and for every orange you started with, add a cup or a cup-and-a-half of water, depending on how thick you want the marmalade to be. Cover the bowl with a cloth (not plastic wrap) and keep it for two or three days at room temperature, stirring occasionally. Now the first boil: with a lid on, simmer the fruit in a large pan for an hour or two - until the peel feels soft when you squeeze it between your fingers (don't burn yourself!). Pour the fruit back into the large bowl to cool. The secret of the second boil is not to do it all at once. Measure four cups of the fruit into the pan with three cups of sugar and boil rapidly for 15 or 20 minutes. When it starts to thicken, put a small amount in a dessert or tablespoon and put it in the fridge. If, after a few minutes, you detect a skin on the surface, it's ready. Take the pan off the stove and let it cool for five minutes (while you remove the seeds) before putting the marmalade into sterilized jars and hot water process. If you'd live somewhere close I'd ask you to trade some of those beautiful jars against some of my sea buckthorn jam jars (I still have about 20 of them, I think). Unfortunately, sea buckthorn is not a citrus, otherwise I'd have posted about it. So I wrote about marmalades and syrups ;-). Manny, your posts are outlandishly mouthwatering - awesome stuff and sounds great! ap269 - Love the idea of a swap and exchange, I think some of the Toronto folks are planning one of these. Joel - thanks so much, I so glad I joined up, learning and loving it. Wow, what a wonderful display of preserves! Which is which in the picture? Buddha's hand marmalade is in the middle, and the jewel-toned jars on the left...? The 8 on the left are Ayesha's recipe, then the Buddha's Hand and finally the Alton Brown recipe.